The domestic bond market woke up this morning to find itself pushed up against the same ceiling that had offered a friendly bounce late last week. Between now and then, we've seen solid enough progress to reinforce that ceiling, but now it is called into question after a few short hours of bad luck. The overnight news and resulting chatter from traders and analysts blames one thing for this particular move: the Total Social Financing (TSF) figure released by China at 4am ET (also referred to as Aggregate Financing, essentially "loans"). The contention is that strong loan growth turns the cogs of the Chinese economy, thereby decreasing the odds of a global growth slowdown led by China and Europe. Easy enough to connect those dots, but why do we suddenly care about this TSF business? That's a good question. Indeed, I can find little mention of its market moving capability in more than 11 years of detailed notes and email records (and there are plenty of daily outlooks and recaps from analysts and trade desks in my email). In those 11 years, it was mentioned only a handful of times and never in such a way as to deserve credit for a move like we're seeing today. Casting additional doubt on this narrative is the fact that a big pop in China's March TSF number (which is what was reported today) is often preceded by an even bigger pop in January. Take my word for it that if we look at the few years preceding the chart below, the pattern plays out with similar regularity (it would have made the chart too hard to read to squeeze it all in). 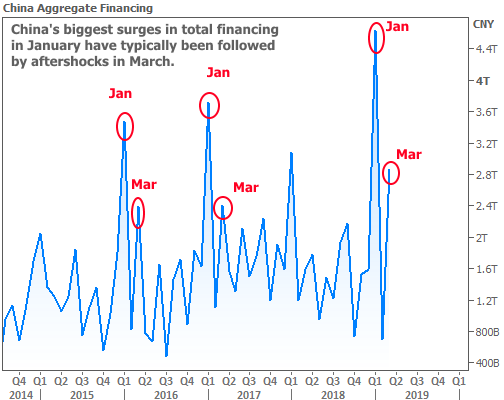 Clearly, there's something going on with the timing or the reporting of Chinese loans, and it wouldn't necessarily be a big surprise to see the biggest March after the biggest January. In fact, it was more surprising NOT to see that pop in 2018. Zooming into the intraday chart, we can see that the 4am release of the TSF data definitely hit the stock market. 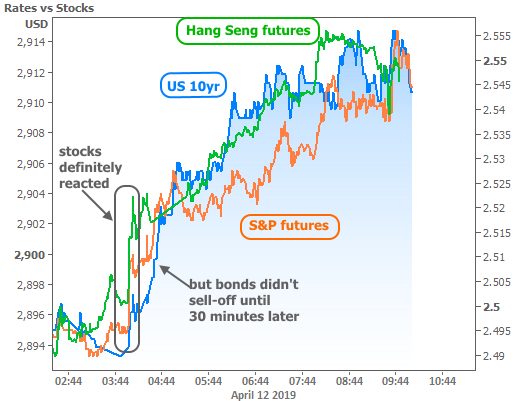 At first glance, it looks like it hit bonds too, but it wasn't really until 4:25-4:30am that 10yr yields really started moving up. 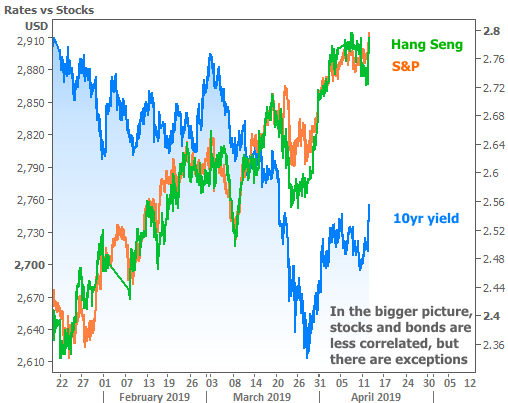 In looking at the chart above, we need to remember that it's NOT the correlation between stocks and bonds that's on trial. It's the TSF data. We can't give that credit for much more than the first little pop in stocks. There were too many other pleasant market surprises later in the morning (EU and US economic data, bank earnings, German central bankers talking about stimulus boosting growth). 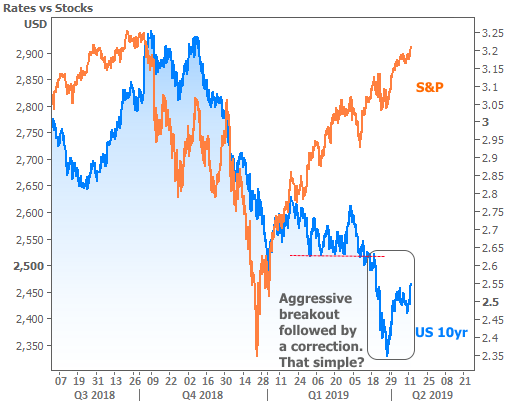 And while we can give a stock surge some credit for coinciding with a "risk-off" move in bonds, we can't give it all the credit. Ever since that breakout bottomed out, I've warned that a return to 2.55% was possible. It looked like that had already happened last week and we were clear to begin sailing off into the sunset. Today's weakness throws those plans into question. 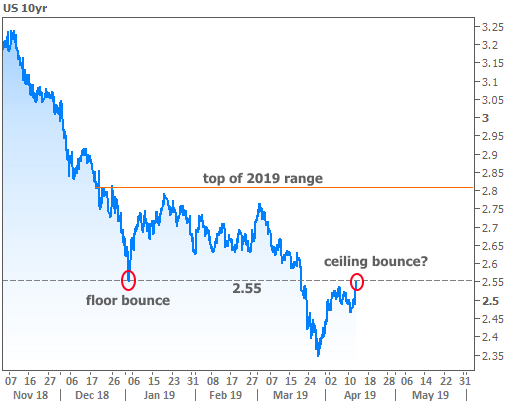 If we don't get a solid bounce today or tomorrow, we'll be looking for our next ceiling somewhere between here and the top of the 2019 range.